Lily Tomlin isn’t feeling well. Next to Tomlin, rubbing her back and offering assistance in any way possible, is her Oscar-winning friend and co-star, Jane Fonda. The two acting icons, sitting side by side on a cozy L-shaped couch, just released the new season of their Netflix hit a few days earlier, and they’re already deep into shooting Season 3. Considering the grueling 16-hour shoot days, it’s no surprise anyone would be feeling a bit tired. But all these two are thinking about is making more. Fonda and Tomlin both want more “Grace and Frankie” — more seasons, more often. Spurred on by positive feedback for a terrific second season, the pair have gone so far as to lobby Netflix president Ted Sarandos about releasing more than one season per year. Clearly, the network is the only thing stopping them. Below, we dig into why they’re so passionate about the series, what feedback from fans means to them and what was so special about the final, tremendous scene of Season 2. Season 2 just came out. You’re already shooting Season 3. What’s that like for you, as actors? TOMLIN: It won’t be out for a year, though. It’s just horrible. FONDA: I wish that they could sparse them out more, so we didn’t have to wait so long for the next season. I mean, I’ve talked to Ted Sarandos about it. TOMLIN: It could mean a lot more seasons for us. Yeah, if you guys just keep working nonstop, you could get a bunch of them. TOMLIN: Yeah, at least two a year. The production is just rolling straight through. How much time did you have off between? TOMLIN: On the calendar it looks like you have a few months off, but you’re doing press. FONDA: Well, you got about five months, six months off. Enough to do a movie. TOMLIN: It didn’t feel like it. FONDA: Yeah, that gets hard then. True. FONDA: Last season, between the Emmy nomination and then “Grandma,” she was working nonstop. FONDA: [whispers] I don’t know how she does it. TOMLIN: I have to go to Oklahoma this Saturday because it’s an old date. It’s an old date that was left over from last year. FONDA: We all went down and saw her in Long Beach a month or so ago and I mean, it’s a physical show. I just don’t know how she does it. FONDA: They have our mirrors in the workout place. We should go check it out. I finished Season 2 last night with a binge. JANE FONDA: Oh, so tell me. I loved it. That last scene in particular. FONDA: Isn’t that a good scene? What’s it like for you, as actors, balancing the comedy and drama of those bigger moments? TOMLIN: I must not have my finger on the pulse because I feel like it’s just what we do. And it’s what’s on the page, so you play it comedically or you play it not comedically. It’s like real life. All kinds of goofy things happen and you’re laughing and next thing you know, your dog has been hit by a car. [laughs] Oh, I’m sorry I said that. FONDA: Yeah, no I agree. I would say in the first season that we were finding our way. It was a little hard. FONDA: Inevitable, yeah. But now it just seems natural. Sometimes it’s sad and funny. Sometimes it’s sad and there’s a lot of pathos. Sometimes it’s funny and that’s life. Do you guys think about “hitting” jokes when they come up? TOMLIN: Well, if the style of the show were further comedic, then it would be incumbent upon you to fill that style, I suppose. FONDA: She thinks a lot about hitting the joke. TOMLIN: [laughs] I don’t know. I don’t think about hitting the joke ever. In fact, I don’t even find the series that funny. FONDA: Oh, but you do play with different line readings and different tempos. TOMLIN: Yeah, because you know what you wanted to do, but you don’t always hit it. FONDA: I mean, yes, we worry about not getting the tempo, rhythm and reading right for when it’s supposed to be funny, but we also know that if we think about it and it becomes a head thing, it doesn’t work. So, we try to make it organic. That’s her modus operandi. It’s just all kind of organic and spontaneous. TOMLIN: She’s a total pal. Do you feel like the attitudes are similar at all in what you’re trying to create? The scene at the end of Season 2 is not something you would’ve seen on TV in the ’80s or ’90s, but film started hitting those issues in the ’70s and ’80s. Do you feel like the missions are similar? Is there a connection there at all? FONDA: Yeah, I think so. I think because so many good writers are going into television and because of cable and streaming now, they’re very aware of the fact that you can do things that are outside the box — and they’re doing them. The interesting thing to me about “Grace and Frankie” is that we’re not really outside of the box. We’re a comfortable show. People feel it’s not a stressful, and yet it does open up things that maybe only movies did before. I think that’s quite true, don’t you? TOMLIN: [laughs] Do you mean stressful like “Breaking Bad” or something? FONDA: Yeah. “Homeland.” I mean, my heart is in my throat. Even “Empire,” my heart is in my throat. What’s it like to get the feedback about the season that’s just airing while you’re shooting a new season? FONDA: It’s both so enthusiastic and profound — the things they say that they’re getting from it. It’s kind of astounding. So it gives you a little pickup in the work we’re doing now. Don’t you feel that way? It kind of encourages me, anyway. Tired as I may be, there are people out there. We really have got to do our best. TOMLIN: Considering our age, I think we should convince Ted to do two seasons a year. 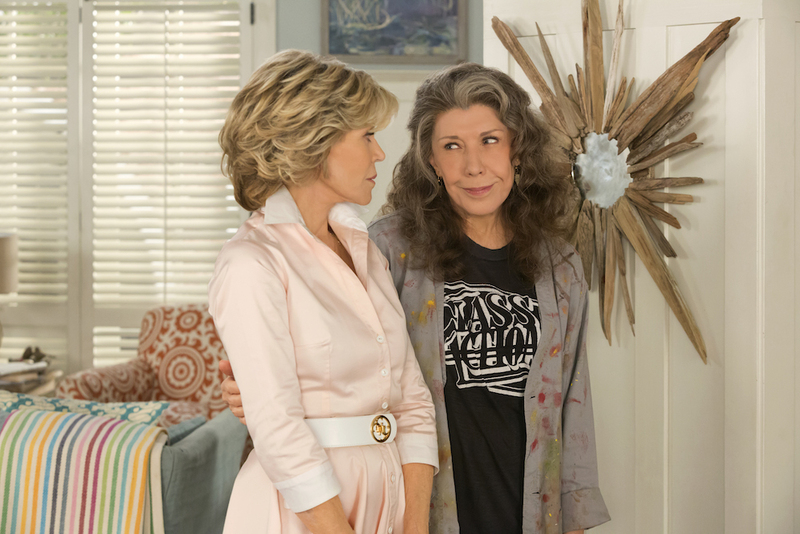 I love that that was a release in the press, they said: “‘Grace and Frankie’ has been renewed for a second season.” And then shortly after they renewed it for a third and they said, “Considering the leads’ age…” They felt like it was expedient! TOMLIN: Well, most shows do have the benefit of midseason feedback. They can make changes, and we don’t have that.